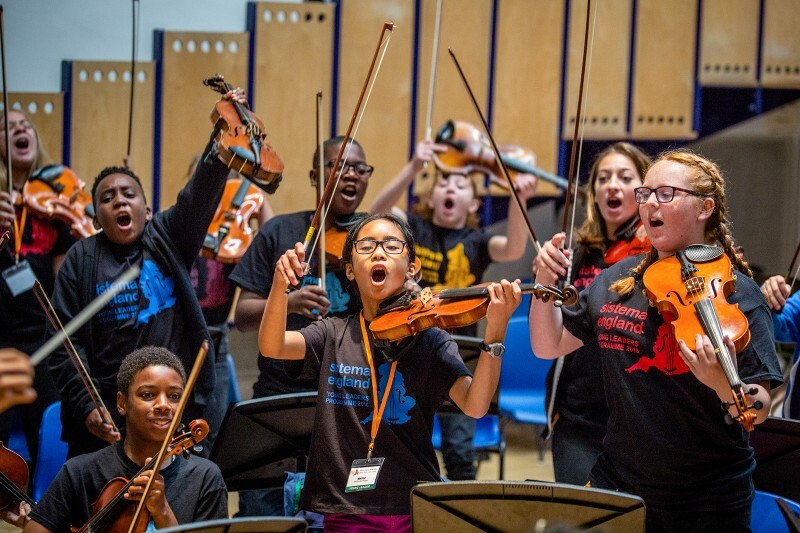 For a week in August 2016 at Shrewsbury School, 60 young musicians, 30 staff and 7 mentors gathered to take the Sistema England Young Leaders Orchestra to the next level. 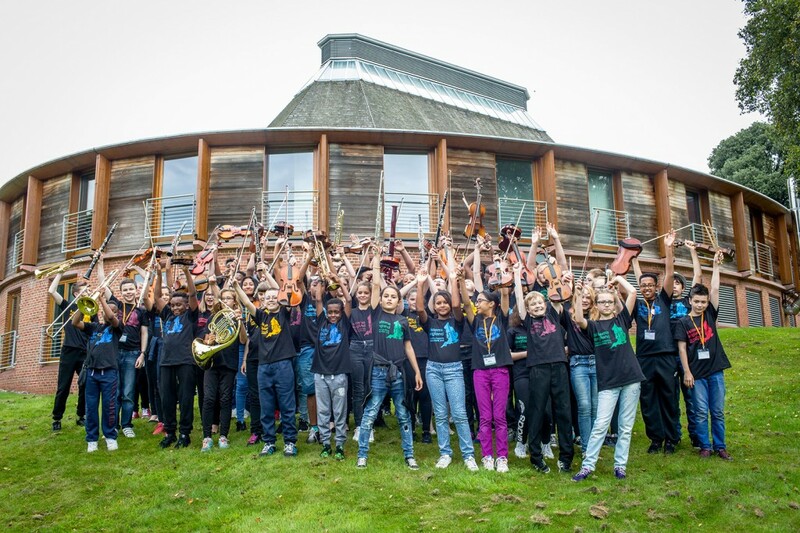 In Harmony Lambeth (London), In Harmony Liverpool, Sistema in Norwich and The Nucleo Project (London) welcomed players from In Harmony Telford and In Harmony Newcastle for the first time as well as wind and brass players. Each day involved intensive music-making, games, social activities, communal dining and informal music-making. The week included a remarkable day at Longborough Festival Opera with Lizzie and Martin Graham, baritone Roderick Williams and violinist Nicola Benedetti, an improvisation workshop with jazz great Pete Long, and ended with an electrifying performance in Malinslee, home to In Harmony Telford. The final morning rounded the Camp with an awards ceremony and goodbyes. In a week, this emerging orchestra took a giant stride forward musically and socially. We are continuing our contact with the Young Leaders to gauge the extent to which their experiences have a positive ripple effect back at home. 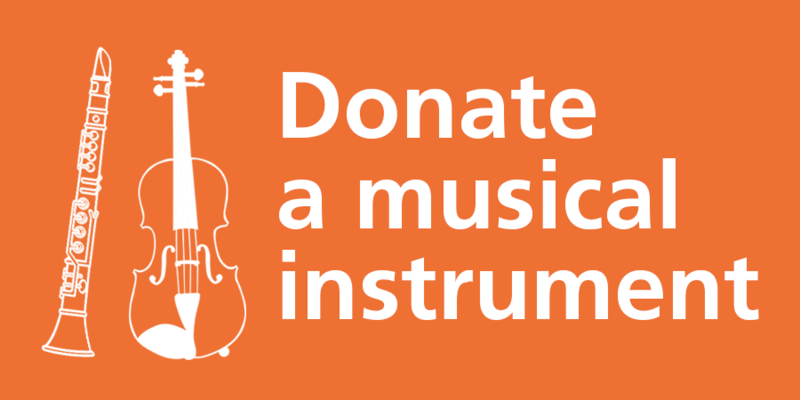 With the support of our outstanding donors and funders we were able to make developments in response to feedback from the Young Leaders, including increasing the Camp from 5 to 7 days, expanding the orchestra from 35 to 60 players and integrating wind and brass sections, and above all, welcoming the 17 young musicians from In Harmony Newcastle and In Harmony Telford. 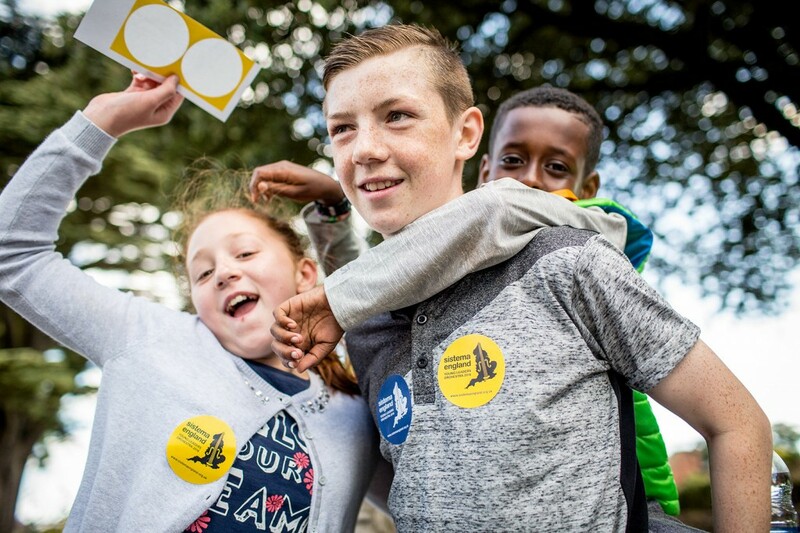 A handpicked dream team drawing on a mix of local and global teachers is a core part of the Camp ethos, combining familiarity with difference – new languages, musical genres, cultures and horizons. Our teachers and mentors hailed from the UK, Portugal, USA and Venezuela. Find out more about this stellar teaching team. The outstanding pastoral team drew on expertise from each of the six Sistema programmes, some of whom have already become core members of our team. Choosing repertoire was a challenge and responsibility – how to select engaging, diverse, relevant repertoire with a high level of challenge for all Young Leaders aged 9 to 17, regardless of current skill, programme, experience, learning styles and perceived personal preferences? Find out more about the 2016 Repertoire and about our #GoSaintGeorges Challenge. Enabling the Young Leaders to explore their own skills and expertise was a vital part of Camp ethos. We worked to encourage leadership, peer support and self-motivation. Read more about how some of these approaches aimed to help our Young Leaders develop wider skills. Two months on, we are awaiting formal feedback, particularly on what impact the Young Leaders orchestra is having for its musicians now that they are back on their respective programmes across England, while we put in motion plans for 2017 and 2018. We are grateful to all the young musicians, teachers, mentors, pastoral staff, parents, community heroes, programme directors, grant-makers and donors, advisors and venue and travel organisers who helped make this Camp a resounding success.